Autorefreshes Your Power Pivot Workbook as Frequently as Desired, Auto-Publishes to Any Location, and Now Sends Email Notifications of Success/Failures – With Attachments! The team has added several new features in the latest version of Power Update. One of them (email notifications that optionally attach the updated workbook or PDF-ified version of the workook), is pictured above. But the biggest new “feature” is that there’s now a 100% free version. Go ahead and download it from the link below, and start using it today. It will work forever – no trial expiration – and will never require payment. It will be installed and working in less than five minutes. Have fun, and if you have any troubles, report those on the Power Update Forum. Simply put, we want everyone to have it. Everyone. It’s a game changer. It will lead to more Power Pivot / Power BI adoption and overall goodness, which is very much something we want. The only limitation in the free version is that it will only schedule one workbook. Every last feature is available – email, PDF attachments, publish to SharePoint and even SSAS Tabular. So if you’ve only got one important workbook, you can use the free version forever. A lot of people will run that way, and we’re ok with that. If you someday end up with more than one workbook that needs refresh, you can opt to purchase the full version, which can schedule as many workbooks as you want. Yep, if you’ve got multiple computers, go ahead and install the free version on ALL of them. Use each computer to run a different workbook. Totally cool. We WANT you to do that. We want Power Update running everywhere. At some point if you run out of spare computers, then maybe you buy a license or two. We’re ok with this loophole. Go crazy. Timestamping output files – so if you want each copy of the workbook to have its own unique filename, with the date and time of the refresh “stamped” on it, you’re covered. The ability to run macros – before and/or after data refresh. So if you’ve got something that pre-sets slicers or something, go crazy. Support for password-protected workbooks. Self explanatory. Ability to let macros handle the refresh – if your macros themselves process the data refresh, check that checkbox and Power Update won’t repeat the refresh. Read the original Power Update announcement HERE. Get support and/or share your opinions/reactions in the forum HERE. Thank you! I am spreading the word on PowerPivotPro and Power Update. For those of us who have Dropbox blocked at work, is there another path to download? Thanks for sharing! I’ve also added this alternate location (ZIP format) above in the original post. So you say its “100% free” and it says “Click here to buy full version” so what is exactly 100% free?? 🙂 aggghh sorry if its a stupid question!! As said above, it will run forever and never expire, never require payment. It provides all features and capabilities for free, but limited to one workbook per machine. Ya right if I can read properly won’t that help, probably that’s why I have glasses 🙂 Thanks anyway for your prompt response. I am exploring it and my another silly question is on its way. 1.Task failed with message “A window that required user interaction was detected during refresh, please check if the workbook can be refreshed manually or run the task with Options\Diagnostic Mode enabled to find out the actual problem.” When I run it in Diagnostic Mode it works just fine and successfully. I also got refreshed PDF as email attachment. The datasource connection is set to Windows Authentication in the workbook is that making any difference? I am sure all latest version are installed of PowerPivot, PowerQuery but that should not matter right if it’s working fine in Diagnostic Mode? 2.When the task failed I did not received the failure notification even though all Email Settings for Failure and Success are same (trust me I checked it correctly this time with glasses 🙂 ) They are not even in Junk folder I checked there too. Anything I am missing? 3.Email Settings – Did all the settings and set Attachments as “Updated file as PDF” click ok. Open it again the Attachments setting shows as “None”. Is it resetting itself? Not a biggie just though to share with you. These are fixed in the latest version. You should get a new version update notification. Or you can re-run the setup which downloads the latest version. How about one full version to more than one device? Can we implement like that? This is great Rob. Definitely including this in my presentation at SQL Saturday Silicon Valley this weekend on Automating Power BI Creations. Keep up the great work! Thanks Angel! Wish I were there to see the talk. Brilliant! I LOVE this product so far. It has made a huge impact on planning self-service BI applications and simplifying things. We were asked to design a data collection and reporting application for a small one-month team competition. We decided on a simple setup in which members record a score daily in their own Excel workbook via Excel Services on Sharepoint. The aggregated results are collated via a simple Power Query script into a unified data model, which is saved to the competition site’s document library. That model is updated daily behind the scenes thanks to Power Update enabling refresh of Power Query driven models, and a great looking Power View built from that model allows team members an interactive window into results. Time to create this solution? 25 minutes. It would not have been nearly as easy without the help of Power Query, which can be used extensively now thanks to Power Update! Windows Task Scheduler requires Administrator rights to create tasks. We wish it didn’t, but you have to ask IT to help you get it installed. You do NOT need administrator for the tasks to run. Hi, does Power Update require Excel to be installed on the machine that it is running on? I.e. can it run on a server without Office and update Excel workbooks in SharePoint that use SSAS tabular as the datasource? So, in the Email settings, it is limited to one email configuration universally applied to all tasks? That’s only the default setting. You can override it for each task in the wizard. Oh, yes. I see that now. Thanks! I love the new email feature. The amount of insight that an Excel pro can now automatically deliver to an executive’s email inbox using the Power BI / Power Pivot / Power Query / Power Update toolset is mind boggling. This powerful toolset is definitely going to steadily increase the salaries of Excel pros in the coming years. Unfortunately I faced an error attempting to enable an excel add in called Power SQL Update. Something like “Unable to initialize”. My excel is x64, Power Update as well. If only there would be an option to delete connection from the workbook before loading it into SSAS. Also can I load multiple PP model into one SSAS database extending it? Is it allowed? You could delete the connections with a macro running after the update, but if you’re updating SSAS cubes it’s suggested that you maintain the model in Excel as any changes are overwritten at the next restore. As for the last question, only one model can be restored to one database. I’ll try to reinstall the latest version. A little unrelated to the awesome Power Update product, but I think with the intelligence posting in this thread I should be able to get an answer. We are using a 2013 SharePoint farm to display our workbooks. However, the users are unable to click into the spreadsheet or even click the buttoms such as File on top ribbon. We have not protected the workbooks. I am wondering if this is a SharePoint setting or an Excel setting. Any help would be greatly appreciated! I have no idea why but I cannot get Power Update to refresh any of my workbooks with Power Query connections. To be fair, these Power Queries are testing the edge of my computers capabilities but I am able to manually refresh the connections within the PowerPivot window in under 15 minutes just fine. When I take a look at the task manager when I manually refresh this model, way more resources are thrown at it. Meaning it opens up 4-5 mashup container refreshers and the Excel process is much larger also. Alternatively, when trying the update with PU, it only has 3 mashup containers and a smaller Excel process. When I run PU in Diagnostic mode, nothing happens in Excel except it just freezes. Any ideas?? I would really like for this to work! This would be a game changer where I work! 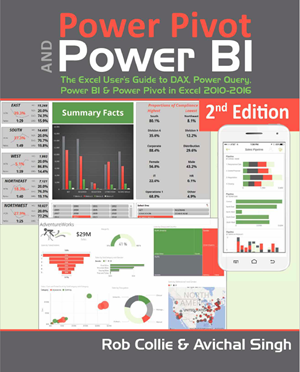 Are you using Excel 2010 and Power Query as data source in Power Pivot? Yes, sorry for not clarifying. I am using Excel 2010 – 64bit, and Power Query v2.18 (due to the dreaded mashup.oledb.1 etc.. not provided error). Hi Kellan would you mind posting this over on the Power Update forums? (Link in the article, above). I suspect this is due to the “parallelization” being on by default. That is a setting you can toggle. But the forum is the place to get that answer, because I am merely guessing. Oh of course. I remember seeing that option. I will post my issue on the forum though. Thanks so much for helping! Sending email failed. Error: The message could not be sent to the SMTP server. The transport error code was 0x80040217. The server response was unavailable. Hi Debbie would you mind posting this q on the forum? Link is in the article above. Also, when posting to the forum, please specify whether you have 2-step verification enabled on gmail (the kind that requires a text message code whenever you log in from a new computer). What is the difference between a free and licensed version? Assuming using with multiple workbooks is one of them? Where can I find pricing info for the licensed version? • Create an unlimited number of update tasks. Maintain your entire portfolio of models and dashboards. • Schedule entire folders or document library of workbooks without having to select each workbook. • Update “thin,” report-only workbooks in a “hub and spoke” system (in Power Pivot for SharePoint or SSAS Tabular environments). • Scheduled export of PowerPivot tables (including DAX calculations), Power Query results to SQL Server tables (e.g. enables using Power Query as an ETL service). Can this tool also be used for the new Power BI online/ .com/ v2.0, (the current preview)? In the destination type screen I do not see that option. I don’t think it can schedule a refresh to Power BI directly, but it can schedule a refresh to OneDrive and then you can schedule Power BI to refresh directly from OneDrive. is it free to schedule power bi refresh from one drive ? Thanks for all what you do and let me add I am really enjoying your PP Online Course…. keep it up I am really hooked on it. It’s been a long time since you posted the question, but Yes, you can refresh Power BI Desktop files to Power BI or you can send them directly to One Drive. Both works in the free version. Seems like a great product though I tried the free version this weekend and received a message that “The Source and Target folders match. The free version does not support overwriting the source file”. Was just trying to update a single workbook. There appear to be issues installing the current version of Power Update. I have downloaded it twice and I am getting “This installation package could not be opened. Contact the application vendor to verify that this is a valid Windows Installer package.” as an error message each time I try and install the software. Is this product good for Excel 2016? Yes, it works fine with Windows 10 and Office 2016, in addition to all server versions of Windows Server. The application is really struggeling with browsing folders to select “Target folder” , the browse windows wont let me “drill-down” in the folder structure. Some folders work, others don’t. I have windows 10 on a Lenovo T450s machine (2015 model). Another free tool that saves time, money and reduces the headache of trying to find something that will do the same task. Brilliant! I’m getting the same issue as Mike C back in March – Symantec Endpoint Protection considers the pusetup.exe to be malicious / untrustworthy. I tried both links. Same result from my personal machine – files from both links are blocked as malicious and automatically deleted by Norton Internet Security. I installed it but i dont’ see any such in excel? Do i have to do any settting here? Hi Rob, I tried running a scheduled task when logged off the PC and got an error “Task Scheduler failed to start: Error Value: 2147943645 “. The task completes successfully when I am logged on. My question is: Is there a way to run the free version when being logged off PC? Can let me know if the current Power Update Full Version (licensed) has the radio buttons “Run only when user is logged on” and “Run whether user is logged on or not”? “The ability to run macros – before and/or after data refresh” Are you talking about VBA macros?